The early life of Jesus Christ is mostly shrouded in mystery, but you'll discover that what we do know, makes an insightful Bible study lesson. Please read Luke 2:21-40 before starting GraspingGod.com's free Bible study lessons, #2.03. Previous lesson: Mary Mother Of Jesus #2.02. 1) Was Jesus a Jew? 2) In what town was Jesus raised? 3) What language did Jesus speak? The early life of Jesus is a tad mysterious because of the near silence of the Scriptures. A possible reason for this is that Christians are called to focus on the nature and work of Christ, and not on the details of his humanity. I'll do my best to collect what little information is known to us about the childhood of Jesus and put it together in this Bible study. We'll start a study on the early life of Jesus by answering a question about his heritage. Was Jesus a Jew? The Christ child was a Jew, yes, both in blood and religion. I once had a news reporter ask, "Jesus wasn't a Jew, was he?" I responded by saying, "Yes, and that Jew lived the greatest love story ever known to mankind." It turned out that the reporter was a Jew. He found the information intriguing. Mary, the mother of Jesus, was in the line of King David of Israel. Jesus' biological father, of course, was the Holy Spirit, therefore Jesus' paternal genetics are unclear. I guess it's possible that the Holy Spirit could have used Joseph's seed, but only after supernaturally removing the sin nature. Let's ponder that for a moment, but then move on to what we do know. The answer is that Jesus' mother and step-father, Joseph were fully Jewish and they firmly educated him in the religion of Judaism, as well. Please keep in mind, though, that Jesus is the Savior of ALL mankind, not only the Messianic Jews. We do know some things about Jesus' neighborhood that we can share. Nazareth was a small town despised by mostly everyone during this time. For instance, "Philip found Nathanael and said to him, “We have found Him of whom Moses in the Law and also the Prophets wrote — Jesus of Nazareth, the son of Joseph.” Nathanael said to him, “Can any good thing come out of Nazareth?” Philip said to him, “Come and see” (John 1:45-46). Is it any surprise that the early life of Jesus was lived in a humble town (Philippians 2:6-8). The Nazarites were also dangerous and violent, as noted here in Luke 4:28-29, where Jesus was first preaching to them,"When they heard this, the people in the synagogue were furious. Jumping up, they mobbed him and forced him to the edge of the hill on which the town was built. They intended to push him over the cliff, but he passed right through the crowd and went on his way." It's no small wonder Jesus said, "A prophet is honored everywhere except in his own hometown and among his relatives and his own family." (Mark 6:4. Nazareth was a tough neighborhood to grow up in, I'm sure. God the Father used this Roman military outpost for the childhood of Jesus Christ in order to expose him to the sinful, hurting, common people of the day - those who he came to save. Relating to the common people of the day came naturally to him during his ministry. He was compassionate to all people, partly because of his upbringing in Nazareth. King Herod ruled during the time of Jesus' birth and he had heard about the Christ child. The thought of a Jewish king being born in his domain terrified him, so he passed an edict to have all male children under two years of age killed. The early life of Jesus was lived with certain levels of tempered fear because of the political threats. Joseph was told in a dream to take Mary and baby Jesus to Egypt to escape the slaughter. God's sovereignty would not let any harm come to the Christ. They obeyed and lived there until King Herod died and then returned to Nazareth. The early life of Jesus is capsulized in this single passage from Luke 2:40, "There the child grew up healthy and strong. He was filled with wisdom and God's favor was on him." There would have been nothing odd about Jesus. He would have looked similar to the other neighborhood kids. Well, he was sinless, which was a LOT different than the other kids! We can only imagine the ribbing he took from his brothers, sisters and friends because of his incessant obedience. The peer pressure had to be enormous on the young Jesus! The lack of sin's blinding effects on Jesus' heart and mind allowed him to learn the Hebrew Scriptures at an accelerated rate. Normal humans deal with effects of the sin nature on the mental and sensory systems in our lives. Jesus didn't have such issues. Jewish children studied and memorized the Scriptures from the ages of 6-11 years old. The early life of Jesus was filled with memorization and much learning. The kids attended schools where the rulers of the local synagogue were his teachers. Joseph and Mary could possibly have acquired a scroll with the Scriptures, as well, giving Jesus extra teaching at home. When Jesus reached age 12 he would have become a Son of the Law, meaning he was a responsible free moral agent. What language did Jesus speak when he was young? That is such a great question and we have a solid answer for you. He didn't only read and speak in Hebrew, which was his native tongue. Aramaic had been spoken since the Babylon captivity days, so many Jews spoke Aramaic and we know for a fact Jesus did, as well. Nazareth was in the land of Galilee, which had a huge Greek presence. Therefore, Jesus learned the Greek language, too. The early life of Jesus found him proficient in three major languages of his day - Hebrew, Aramaic, and Greek. Learning so many languages also lends to the growth and development of a person's mind. Jesus learned carpentry from his step-father, Joseph. You may have seen the bumper-stickers, it's true, Jesus was a carpenter! Records from Justin Martyr, who lived soon after Jesus Christ, revealed that Jesus was an outstanding craftsman of wooden farming tools. What would you expect from such a gifted and gracious young man? Many people came to him for yokes and plows. This physical trade would have formed the young Jesus into a strong man. He also acquired much of his wisdom and relational skills from his line of work. The plan of God had Jesus settle into this community with this occupation, in order to humble him. Because of all these things in the early life of Jesus, he was prepared for his future ministry. Don't you enjoy learning about Jesus Christ? Studying his personal growth is just one way of knowing him better and loving him more. I hope you enjoy hearing about the early life of Jesus, as well. The early life of Jesus instilled many things into his life, which would be beneficial to a successful ministry. He grew up amongst common folks and could thereby relate to them. He had a strong religious education, which developed his understanding and wisdom. He learned three languages so he could personally communicate with many different people. He also learned how to work hard in a trade, which toughened him and prepared him physically for a brutal ministry. Not one thing in the early life of Jesus was an accident. Every moment of his existence was under God's sovereign care. The same is true of you and me. We were born to our special parents, which God orchestrated. We were raised in a certain parenting style, with many experiences along the way. Our education and development led us to where we stand right now. God wants to meet us right where we are. Our lives are under his sovereign care and he wants us to join his family through faith. You can help God's kingdom grow, too, just like Jesus Christ did. The early life of Jesus gives parents a wonderful model in which to raise their children. We need to offer our Christian children a strong education, with much Scripture learning. Memorization work is essential, so that a child's mind is strengthened and expanded. Children need to be raised with firm discipline and strong morals. They need good exercise and physical strength-building activities. Jesus' life is a great example for us to follow, even his early life for raising our kids. 1) Notice the care given to Jesus from both God and his family. 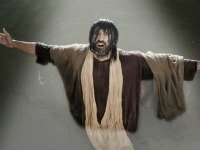 Does the supernatural intervention in protecting the Messiah-King grow your faith in Jesus Christ? 2) I struggle with two prophecies that discuss the Messiah's physical appearance, Psalm 45:2 and Isaiah 53:2. Read and discuss. 3) In learning the Jewish teaching methods that were employed for children in Jesus' era, how can we better educate the Christian children of today? When they couldn’t find him, they went back to Jerusalem to search for him there. Three days later they finally discovered him in the Temple, sitting among the religious teachers, listening to them and asking questions. All who heard him were amazed at his understanding and his answers. “But why did you need to search?” he asked. “Didn’t you know that I must be in my Father’s house?” But they didn’t understand what he meant. Then he returned to Nazareth with them and was obedient to them. And his mother stored all these things in her heart. Father, forgive us. Please show us our error, and lead us to repentance. After sharing this Bible study lesson on Facebook or Twitter below download your FREE printable Bible Study Lessons (pdf version): The Early Life Of Jesus, Lesson 2.03. Please Donate to GG.com. Special Note: I'm grateful to Big Book Media & Free Bible Images for the use of their photos for The Early Life of Jesus Bible study lesson.